Titans Eve from Vancouver play heavy metal with thrash and modern metal influences. The band was formed in 2008 by Gamblin brothers Brian and Kyle along with Casey Ory and Jesse Hord. They released their excellent debut album The Divine Equal in 2011, followed that up with Life Apocalypse in 2012 and now unleash third album Chasing The Devil. They seem to be a great bunch of lads, as demonstrated by brief communication via Facebook. The guitar work is consistently good and often thrashy. The vocals are aggressive with a shouted snarl, but also somehow mechanical, sounding like an effects pedal has been used, creating an unusual effect like some kind of malfunctioning, angry vocoder. At times this sound is alarmingly like Pitchshifter’s J.S. Clayden. Not that Clayden’s vocals are bad. No, they complement Pitchshifter’s music perfectly. But that music is industrial metal, whereas this is heavy metal with a sizeable helping of thrash and it could really do with some high-energy, high-pitched metallic screeching. After the fairly basic, in-your-face opener “We Defy”, “War Path” is an improvement, starting with more imaginative guitar work before catchy rhythm work, a highly headbangable chorus and even featuring an entertaining, yet brief bass solo. The second half of the album is far more interesting than the first. The title track combines Maiden-style riffs with modern metal verses, a thrashy chorus and an impressive guitar solo, which also strays into Maiden territory. This is followed by album highlight, “The Grind”, with rhythm guitar sometimes very similar to Metallica’s “The God That Failed”, an extremely catchy chorus that sounds like it could have been on Wild Dogs’ fantastic Reign Of Terror, with even a hint of Michael Furlong’s distinctive drawl detectable and another winning guitar solo. “Stranded” is a complete departure from the rest of Chasing The Devil. It’s a rare tender moment for Titans Eve – an instrumental piano ballad that may leave you wondering whether you’ve accidentally tuned into Classic FM. It seems hugely out of place; maybe the band fancied slot on an easy listening compilation or an audition writing music for television adverts. Joking aside, although it’s an unnatural fit, it’s actually a very pleasant and emotive piece of music. 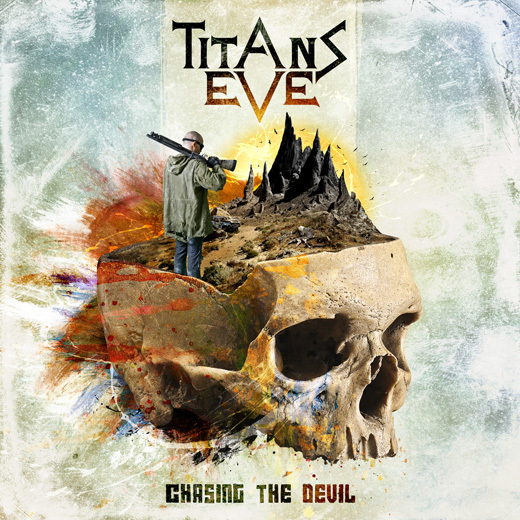 Titans Eve know how to write a decent tune and there are a few on Chasing The Devil, although it rarely reaches the standard of the debut album. The vocals are distinctive and while some listeners will enjoy them, they are sure to split metal fans. The band may find that they appeal to a wider audience if they explore a different vocal sound next time out. Hopefully album number four will be the big breakthrough. This entry was posted in Reviews and tagged Brian Gamblin, canada, Casey Ory, Chasing The Devil, Classic FM, iron maiden, J.S. Clayden, Jesse Hord, Kyle Gamblin, Life Apocalypse, Metallica, Michael Furlong, Pitchshifter, Reign Of Terror, The Divine Equal, The God That Failed, thrash modern metal, Titans Eve, Vancouver, Wild Dogs.